We drank a lot of tea during our month in Japan. 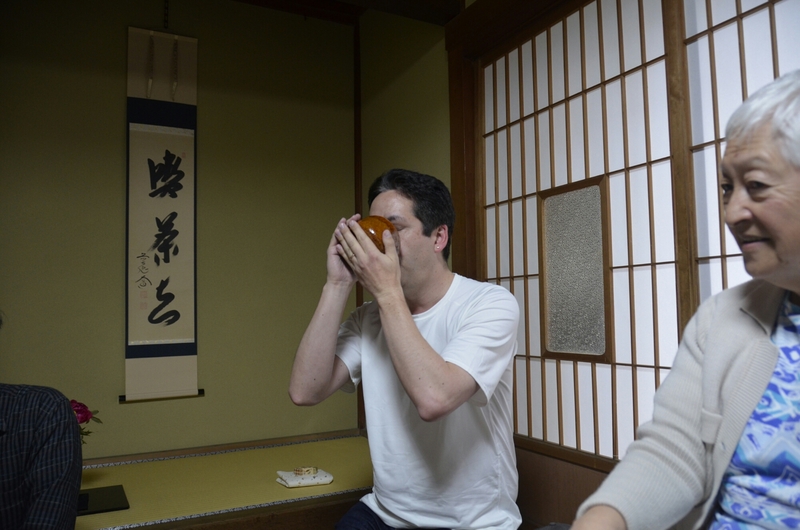 One time we enjoyed a special treat in the form of a traditional Japanese tea ceremony. The ceremony, called “cha no yu” (茶の 湯 literally, “boiling water tea”) is a very formal and stylized ceremony in which powdered green tea (matcha 抹 茶) is prepared and served to guests. It is a very beautiful ceremony to watch. Japanese people of all ages study and practice cha no yu for years. Our ceremony was performed by one of my mother’s former students. She learned English from my mother almost 60 years ago, and we laughed a little when we realized this was the first time she ever heard my mother speak Japanese. When my mother taught, she spoke only English and indeed convinced most of her students she knew no Japanese. We were ushered into a tatami mat room that had a small hole in the center of the space. In the hole, hot coals heated a pot of water. This sunken hearth is called a ro (炉) . I understand that the tea ceremony and the configuration of the room will change depending on the season of the year. We were offered small treats of homemade dried persimmon and other snacks while our hostess carefully and gracefully went through a sequence of steps. She drew hot water from the pot and used it with a washcloth to clean the tea bowl. She carefully measured out the powdered green tea from its beautiful lacquered container, added the boiling hot water, then used the bamboo whisk to stir and whisk the tea, which carefully dissolved the powered tea and created a froth. Once the tea preparation was complete, the tea bowl was offered to a guest. As is customary with any offering, the bowl is presented with two hands and received with both hands. It is also good form to take a moment to admire the beauty of the bowl in which the tea is offered by turning it your hands. Irregularities and imperfections in the bowl are highly prized. I loved watching our hostess prepare each person’s bowl of tea. Not only were her movements graceful, as in a ballet, but even when she set things down or aside, there was a choreography to her moments. When she set down the beautiful bamboo water dipper, it was carefully balanced upside down on top of the tea pot. When not in use, the delicate curved bamboo tea “spoon” was balanced atop the lacquered tea container. The bamboo whisk was stood upright on its handle, ready for its next use. Every movement was planned and executed with deliberation and grace. And the tea tasted wonderful. If you ever have the chance to attend a cha no yu, I highly recommend it! I just attended a lovely tea ceremony in my home town. You may learn about my friend, June, and her tea room at http://www.wakaitea.org.